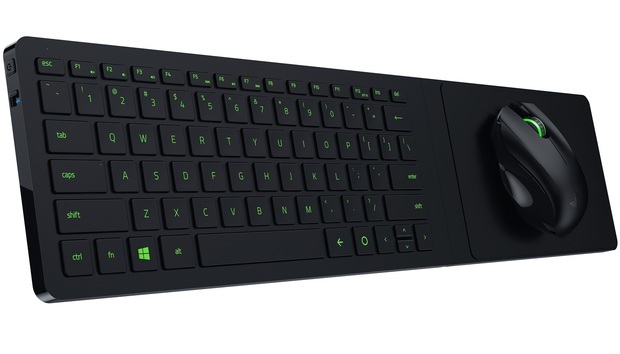 Back in January 2015, Razer demonstrated an intriguing mouse-and-keyboard combo called the Razer Turret, which was designed to sit in your lap for living room gaming. Fifteen months later, it’s available for purchase. The $160 Razer Turret is a slick-looking keyboard and mouse with an attachable magnetic mouse pad, which is meant to keep the mouse from sliding off during gaming sessions. The keyboard supports up to 10 simultaneous key presses, while the mouse has a 3500-DPI sensor. For connectivity, the Turret uses a wireless 2.4 GHz USB adaptor, and it also supports Bluetooth. An included charging dock props the mouse and keyboard upright when they’re not in use. The keyboard should last up to four months on a charge, while the mouse should handle about 40 hours of gaming. The Razer Turret prototype previewed last year at CES 2015. When Razer first announced the Turret, it was supposed to be an add-on for the Razer Forge, a lightweight game console and media streamer running Android TV. But Forge has gone through some tough times since then. Razer quietly abandoned plans for PC-to-Forge game streaming—arguably the main justification for the Turret—and the console still doesn’t support Netflix. While Razer has maintained that it has big plans Forge, and has ported over some of the Ouya game library, Razer didn’t even mention Forge in its latest press release for the Turret. Razer does advertise the Forge on its Turret store page, but the mouse-and-keyboard applications are limited. The Turret keyboard’s built-in Android navigation buttons would be better-suited for the Nvidia Shield Android TV box, which supports PC game streaming from a networked computer or from Nvidia’s GeForce Now cloud gaming service. Really though, the Turret will make the most sense for an proper living room gaming PC or Steam Link streaming box. Why this matters: The idea of making the mouse and keyboard couch-friendly isn’t new, but there aren’t many solutions that don’t clutter up your living room with loose components or look excessively dorky. Razer’s solution isn’t cheap, but its ability to keep things clean could be priceless.